Moody, beautiful, and always in shadow from the surrounding forest, this cabin is what you think about when you think about a cabin in the PNW. 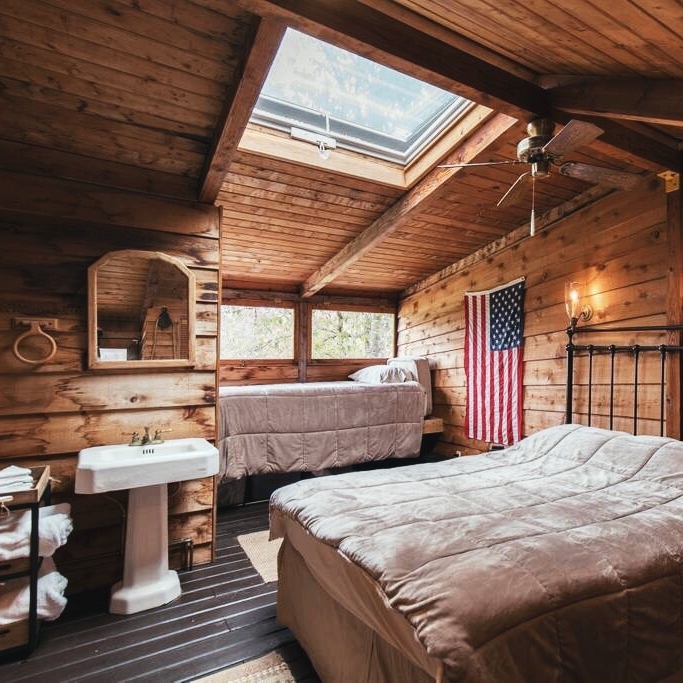 They've got a hot tub on the porch, a river just past the tree line out back, a great kitchen, loft (with a rope to climb up), books, vintage decor, and plenty of wood. Plus there's a bunk room and not only a wood fire stove inside but a classic stone fire pit out front. It's a charmer tucked in the Mt. Rainier National Park and, to be honest, it's more than worth the few hour drive from Seattle, even if it's just for the night. Good for 8 guests, this guy is a little bit vintage and a little bit luxury, all in one. The property actually has two structures - the main house and a bunk house - so it would be perfect for two families or a large group of friends. There are three large decks with views of the water - you won't know where to lounge first. Take advantage of the great outdoor fire pit and make sure to bring your boat if you have one! Located in Skykomish, WA, this 700 sq ft cabin is right on the river, surrounded by forest, and super easy to access during the summer (little tougher in snow - make sure you have tire chains or 4x4!). It's got indoor heating and an outdoor fire pit, plus a loft (with two beds), a pullout couch and a private bedroom. Basically, this is a great basecamp for getting out into the wilderness around you. Just outside of Ashford and right inside the borders for Mt. Rainier National Park, you'll find this rustic a-frame. Not far from the river, near tons of hikes, and just far enough away from everything else, you can nest in this recently remodeled looker while tending the wood fire stove and taking in all the sweet, lulling sounds of nature. At about 700 sq ft, it's quaint and even quainter when you consider they provide you with all the basics you need plus some extras. Located in Washington's Methow Valley, east of the Wenatchee National Forest, these huts were specifically designed as a different way to camp. However, they're much closer to cabin living than camping considering all the amenities they have. With six huts herded together, you'll wake up to views of the mountains and have plenty of opportunities for hiking, rafting, biking, skiing and more. They tend to book up quick (especially during the summer months) so don't dawdle too much. Located on Vashon Island, aka a provincial farming paradise, this cottage is dang cute and has so, so many windows. The bathhouse and wood burning stove are the real winners on this rustic farm; other winners include the owner's dog, Buddy, and Clive the Rooster who might pay a visit. It's a nurturing and idyllic space that seems perfect for spring and summer.